Back in the day, womens' clothes were marketed as having a purpose, and that purpose was to snag a man. 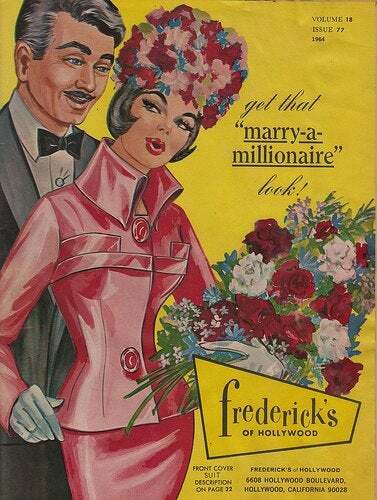 How else to explain this Frederick's Of Hollywood catalog from 1964? The movie How To Marry A Millionaire — starring Marilyn Monroe, Betty Grable and Lauren Bacall — was released in 1953. Afterward, a TV series starring Barbara Eden ran for two years. And ten years later, the FOH catalog promised shoppers could "Get That Marry-A-Millionaire Look." Here, the shoes are not marketed as cool, chic, stylish or indulgent. They're "ultra high," for "shaplier legs" and called "attention getters." "Provocative Pastels." Clearly, the person wearing the garments is not the one being provoked. …And their mission is to "captivate." Even if a woman has fun dressing up, feels empowered when she "captivates" or "seduces," isn't it interesting that the garments are overtly advertised as not really for her?